Imagine then those who, like me, cannot eat wheat. It feels like your favorite toy has been taken away from you and you'll never see it again. Tears begin to prick your eyes and giant ones fill one up and cascade down as you watch happy families' eyes light up at the familiar sight of a steaming platter of thin bread is placed in front of them. Such as us, stand by the door, inhaling the smells with our eyes closed to block envy and transporting ourselves to the good old times and reliving moments whence we could indulge! Aye! Not foie gras, not oysters, to a gluten free/wheat free person, the pizza can become in the moment, the epitome of gastronomy, simply because of its forbidden-ness. Yet, what if It needn't be so? The crust comes out akin to a Neopolitan style pizza; very thin and crisp, yet chewy and satisfying wholesome. It is easily to cut in slices and easier still to hold and enjoy just like a pizza slice. Recently, there have been a few pizza places that offer a gluten free version of the crust. Expectedly they come at a steep premium! Sadly, that takes away much of the glitter and glamor along with the accessibility of this simple pleasure. Imagine having a slice of pizza for $7? That's how much it costs around here to get a gluten free one. And, it is not any better for you than the $2 regular slices! So, last night, in a bid for freedom and conscious of the wallet as also craving, I decided to make the crust at home. Necessity indeed breeds innovation! I have been working with gluten free flours for a while and have developed an intuitive sense of applying them in various recipes. I know how to fix it for a certain desired result by adding natural binding agents or playing with ratios. So, I was primed and ready for the pizza challenge. I was also fully conscious that it will not exactly be the same as a regular pizza. And, that is an important stipulation. No matter what you do, no one can make the gluten free blend behave like a wheat dough. Once that is accepted, what I was going for was to recreate the emotional connection that we all have with our pizzas. Crust - It should crisp yet yieldingly chewy. And, it should be great eaten hot or cold. Temperature - Steaming but not burn-your-palate hot. Toppings - Reminiscent of simple childhood pleasures and comforting lack of responsibility. Flavors - An earthy note from the crust and a heavenly note from the toppings. The very helpful nub in all this is that you can easily make this a healthy meal any day of the week. Also, the huge upside of using a non-gluten blend is that you don't have to wait hours; no need for the yeast to flex its binding powers. Yet, the yeast really creates that earthy tone to the crust and I decided to use it for that reason. Also, while it doesn't exactly work the same way, they do dine on the sweeter gluten free flours and release CO2 and create a light lift to the dough. I made the dough with a gluten free flour blend, boasted with psyllium husk to create a bind that lets you roll out the dough. The crust comes out akin to a Neopolitan style pizza; very thin and crisp, yet chewy and satisfying wholesome. It is easily to cut in slices and easier still to hold and enjoy just like a pizza slice. 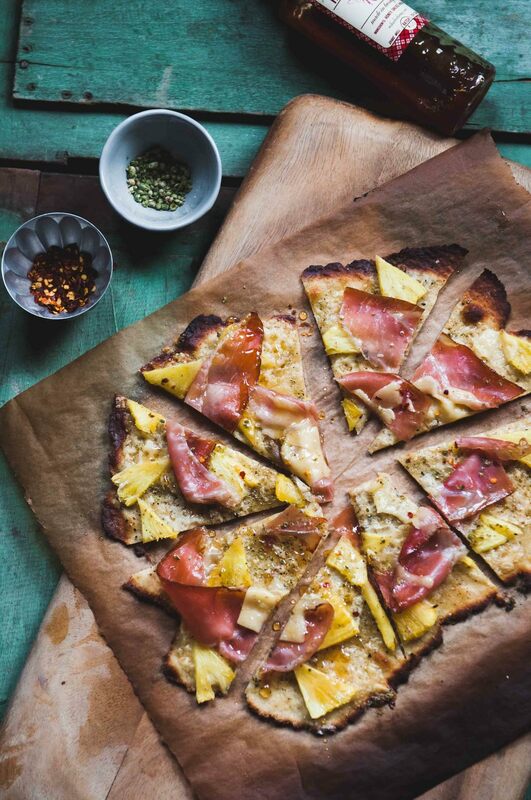 For the toppings, ham and pineapple is a quintessential flavor combination. One that reminds us of summer breaks, beaches and young romance. Don't ask me about the last, it just does! I always think of Grease when I hear this combination. Maybe its just the 80s! ha! Oh! and before I go, a few photos of my rambles :) Also, I have pea shoots! WOOT! Trailmarkers or Cairns lined up as an art work more than a functional utility along the trail. They do make a pretty picture. Pea shoots in a pot! They have been germinated for planting but I suspect some of them are going to end up in my plate as is if I can't untangle the roots! The dough is fairly forgiving for slight measure deviations. So, you don't have to be super exact with the volumes as long as it comes together as a tacky dough. Prepare the dough about an hour before you want to make the pizza and let the yeast do some magic and add flavor to the dough. Sift all the dry ingredients together. Add the wet into a well made in the center and whisk together to make a crumbly mix. Using your hands knead the mixture into a dough. Keep kneading for a few minutes to create an elastic tacky dough that comes together into a smooth ball. If you find the dough too dry, add a few more drops of milk. But, if it is too wet, keep kneading for 2 to 3 more minutes to let the psyllium absorb the liquid. If you still find it gloppy, then add a little more flour. Place in a oiled bowl and cover with towel. Let is rest for an hour. At the end of an hour, the dough would have slightly increased in volume with cracks appearing on top of the surface. This is normal. De gas gently and knead in the cracks. Preheat the oven to 550 F.
Cut two sheets of parchment paper. Sprinkle flour on one and place the dough disk on it. Place the other parchment on top and roll out the dough as thin as you can between the sheets. Slide the pizza on to a baking stone and bake for about 7 minutes. Keep an eye on it. If the edges start to brown too much, pull it out and check the bottom. It should be spotted like a Neopolitan pizza and top should be bubbling. Yet, the pizza should be flexible to fold.